Remember all the great classic Marvel covers from the late 1960s / early 1970s? Some of them may not have been designed by the cover artist, but instead by Marie Severin! Here is one such example, from Sub-Mariner #33, published in late 1971 / early 72. Marie's cover preliminary shows the basic design. The notes on the right suggest the premise: Subby returns to Atlantis to find it in ruins...Krang and gang accuse him of being absent while they needed him. 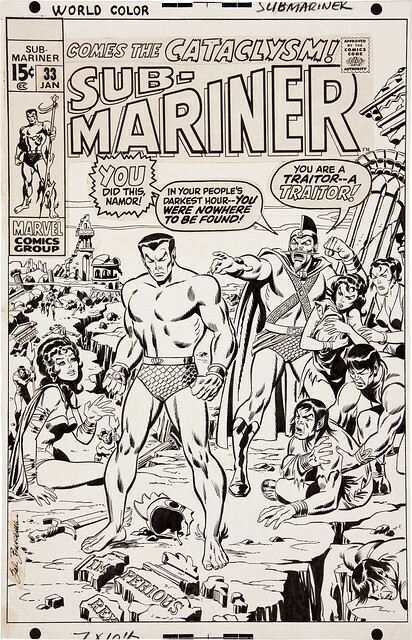 Sal Buscema's original art cover, to this issue, which recently sold for over $8K on Heritage Comics auction site. The final color cover as it was originally published. 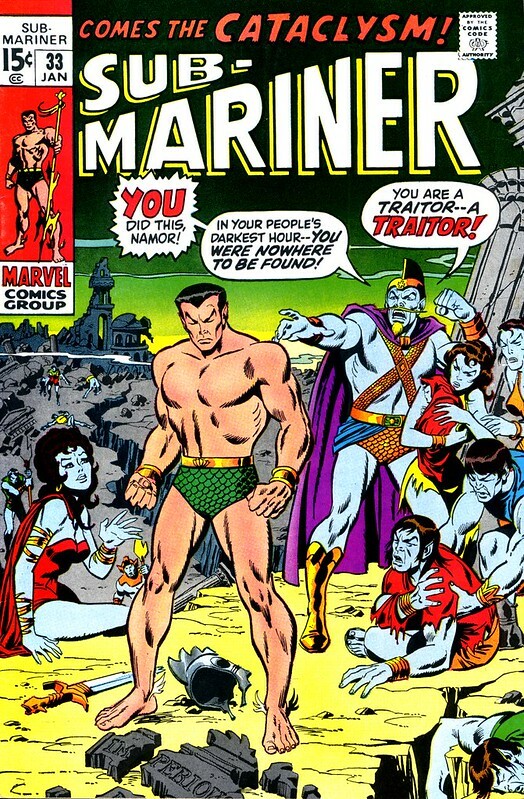 You can see that Marie's template was pretty much executed as designed, with certain elements really made stronger by Buscema: Namor's guilt and pensive pose, Krang's righteous and accusatory stance, the wounded Atlantean nursing a dislocated shoulder! The modern comics companies don't produce covers like this anymore, which give you a disturbing idea about the hero and make you buy it to see how it happened. 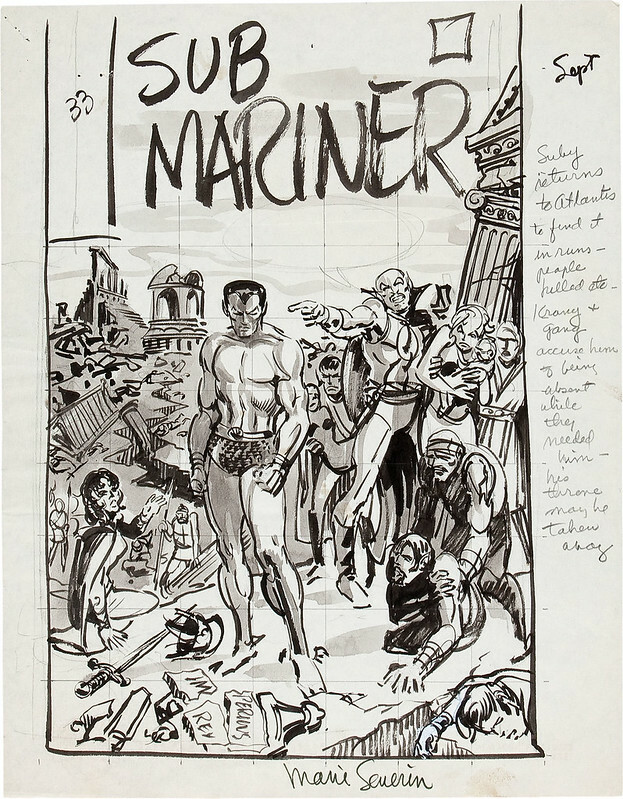 If you want to see some other nifty examples of Marie Severin's Marvel cover designs, see this Newsarama blog post by Graeme McMillan. Nuff Said! Excellent -- thanks for posting this! I love to see the creative process through original art. I actually prefer Ms. Severin's sketch over the final product. It has that Eisneresque kinetic quality, and also brings to mind Darwyn Cooke. Sal Buscema never really reached the level of his brother John, though he was competent. His art was ubiquitous when I used to eat up The Defenders, Captain America, and Marvel Team-Up. Love to see more of these. Thanks.